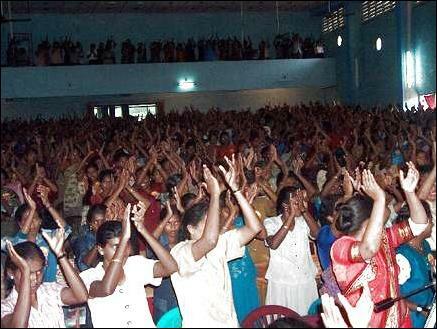 More than 1500 representatives of women’s organizations in Jaffna gathered at the Veerasingham hall in Jaffna town Thursday at 9 a.m., and critically discussed the problems confronting women, in particular, the lack of awareness of social issues among women in villages and barriers to women's development in the spheres of education and economics, sources said. The Government Agent for Jaffna district, Mr. S. Pathmanathan, and Rev. Fr. Damien, an expert in psychology, inaugurated the event. 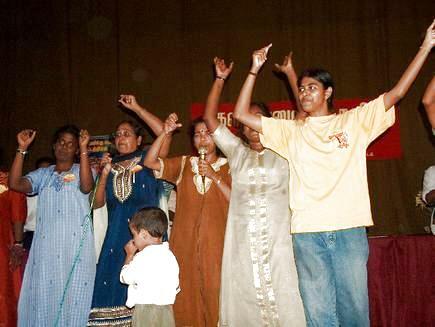 The head of the women’s political wing of the Liberation Tigers of Tamil Eelam (LTTE), Ms. Kalaivizhi, hoisted the Tamil Eelam national flag. Mrs. Rasenthiram Rasamalar, mother of LTTE martyr, Lt. Kaviyaventhan, lit the flame of sacrifice in front of the photograph of Lt. Malathy, and Mr. Solomon Cyril, the secretary of the National Resurgence Movement, garlanded it. 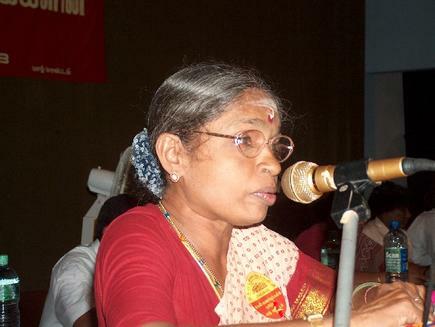 Mrs. Vethavalli of the Jaffna district women’s association gave the presiding address. She said she was happy to see so many women gathered at the event and that she hoped the event would find solutions to the problems confronting women in the district. Ms. Kirithika gave the welcome speech. Mrs. Pathiniamma Thillainayagam Paul, the additional government agent for Jaffna, in her inaugural address said, "In ancient times and during the Sangam period, women worked independently and distinguished themselves in their work, as equal to men. But in the current era, such achievements are not common among women. We should analyze why this happened. “No matter how educated and how many degrees a woman has, women are harassed, beaten or treated with disrespect. Women are not allowed to reach beyond a ceiling. Though treated as equal to men at the wedding stage, women are later oppressed. It is not only some men who are the enemies of women. Some women are also enemies of women. Father Damien spoke on the development of women’s abilities and leadership skills. “The hidden potential for leadership and other skills among women should be brought out. ‘Can’t do’ attitude and inferiority complex should be removed and self-confidence should be created,” he said. Mr.C. 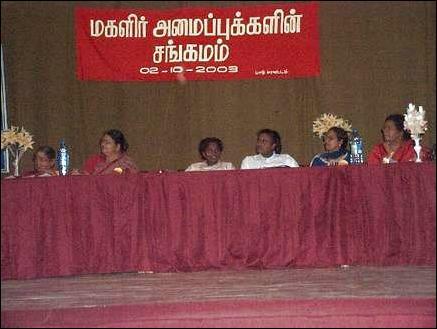 Ilamparithy, the political head of the LTTE in Jaffna, said in his guest speech that when there is national liberation, there will also be women’s liberation, and events like the women’s gathering should contribute to national liberation. “There are many more women than men affected by the war in the Jaffna district. Women should develop their personality, skills and self-confidence. Only then women’s problems will be solved and oppression could be eliminated." Following lunch break, a female student of Jaffna University spoke on the barriers to women’s development caused by the prevailing educational system and how it could be changed to address women’s problems. Women from the University staged a theatre program. 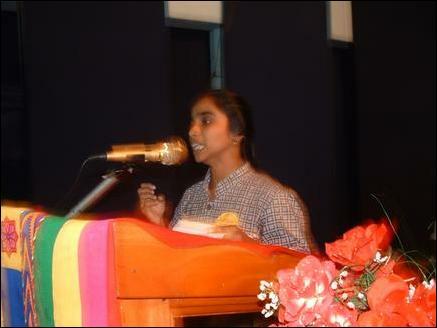 Ms. Thamlini, the head of the women’s political wing of the LTTE gave her speech as the special guest. In her speech she said, “The way people in our society treat men and women unequally should be changed and everyone should be treated equally. The discrimination starts at birth. Society does not use women’s abilities, skills and leadership appropriately. They all think women are too soft to take on responsibilities. But our national leader has developed women differently—courageous women with self-confidence and skill. He proved women could do anything. 1. Bringing together women of all villages and creating awareness among them--To impart confidence among women to solve social problems. To find solutions through the law and through the power of organization. To meet every month to discuss progress of action plan.To nip in the bud any sexual harassment problems and inappropriate sexual behavior among children. 3.Economic problems--To act through trade unions for women’s problems at work places. To distribute work among more workers. To limit the amount of time women are compelled to work. To equalize wages and salaries among men and women. To solve dowry-related problems. Depression among women is common because of the dowry issue. When the dowry system is eliminated, it will reduce the number with depression and improve the mental health of the people. 4.University action --To encourage the women’s organizations at the University of Jaffna to conduct research into social problems and impart knowledge. The event concluded at 5 p.m.